Casino operator Paf and Finnish hotel company Sunborn have opened an international casino on board the five-star super yacht hotel Sunborn Gibraltar.Before the successful launch that occurred on May 16, we had to chance to talk with casino manager Dominick Stenson about this very complex project. Casino Sunborn is located on the yacht hotel of Sunborn Gibraltar. Paf was founded on Åland in 1966 with the clear purpose of creating profit to support public good. This purpose is still the principal reason for Paf’s existence. Today Paf is an international company with nearly 400 employees and offices in Mariehamn, Helsinki, Stockholm, Tallinn, Madrid and Milano. Paf also maintains a large physical gaming operation on land and sea with about 1,300 slot machines and 40 gaming tables on 25 ships in the Baltic Sea and Paf Casino on Åland. Sunborn is a privately owned Finnish company with over 40 years experience in the hotel and hospitality business. Internationally, the Sunborn Group has just over 1,000 employees and an extensive property portfolio, which includes spa hotels, restaurants, yacht hotels and residential developments. 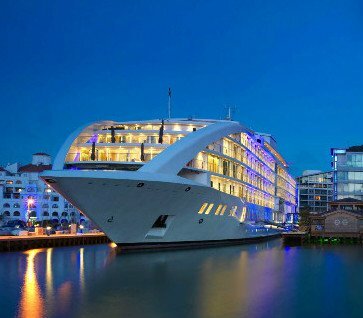 Sunborn pioneered the floating hotel concept and specialises in designing, constructing and managing hotel projects around the world. VegasMaster: How did the collaboration between Paf and Sunborn companies start, and what was the main idea this super project? Our collaboration began in 2014. Paf and Sunborn are both Finnish companies, so in some ways it is natural for us to work together. Plus, Paf is a non-profit organisation and the Gibraltar licensing authorities looked very favourably on the casino project because of this. We both had something to offer each other – it’s a mutually beneficial relationship that we hope will also benefit Gibraltar. Already, the casino opening has created 75 jobs for people from Gibraltar and Spain. How much time and work did it take for this project to unfold? We started the project in September 2014 and we opened the doors for the soft launch on 29th April, so, about eight months. How many staff personal is required to operate the yacht and casino? The hotel has around 180 employees and the casino employs another 75 people at the moment. Strategy wise, are you looking to attract mainly casino players or regular guests that are looking for more experiences? We hope to attract the serious casino players, but we also want anyone in search of a sophisticated casino experience. “We don’t want to offer the type of generic casino experience that is so common in the UK. Our concept is based on reviving the 'Club' atmosphere, intimate, friendly, welcoming and of course a safe, secure and professional gaming environment.” We’re offering American Roulette, Blackjack, Punto Banco, Sunborn Stud poker and a range of the latest slot machines with increasing jackpots. The tables are open daily from 4pm – 4am and the slot machines will be open 24/7 from 17th May. Casino Sunborn offers a variety of games including American Roulette, Blackjack, Punto Banco, Sunborn Stud poker and the crowd favorite Slot machines. Are there any special promotion or publicity acts regarding the casino launch? The grand opening is taking place on Saturday 16th May. It will feature various kinds of entertainment surprises. There’ll be music, including some wonderful live performers—the Marbella Big Band will be conducting their Rat Pack Show, a violinist and a saxophone players plus a DJ. There’ll be some exciting hot and cold culinary delights from the Sunborn’s ‘five star’ chefs for our guests to enjoy, and no doubt our expert bartenders will be pouring some cool Sunborn cocktails. We’ll also be promoting our very generous loyalty and membership programme. What other activists can your guest engage in while on the yacht? The Sunborn hotel has lots to offer anyone who comes to the casino. There is a top class Spa plus gym and the Sky and Aqua bars offer a luxury dining and drinks experience. The hotel plans to offer special “stay and play” packages to guests, which we hope will attract both overseas visitors and people from Spain to spend more time in Gibraltar and on Sunborn. Of course, there are plenty of other activities outside Gibraltar to entertain casino guests. For example, a 20 to 30 minute drive brings you to Estepona, which has a lovely Sunday morning market. Also, Tarifa and the Costa de la Luz are only a short drive from here, and this coast has some amazing beaches. Then there are the golf courses at San Roque, Valderama and Sotogrande, which are world class. Plus, Sotogrande also has international polo events. All these attractions are very close to the Sunborn. In what ways do you hope to segregate yourself from other high-end casinos? Casino Sunborn will offer a completely unique casino experience. For a start, the combination of a five star super yacht hotel together with a casino is not just an interesting destination – it’s also a world first. There is no other super yacht hotel casino. Also, this new casino promises its guests the most exclusive and luxurious casino experience in the region. It’s no casual gaming room: the casino’s smart dress code, it’s tableside drink service, plus its membership programme, all aim to ensure that the Casino Sunborn provides a top quality casino experience.